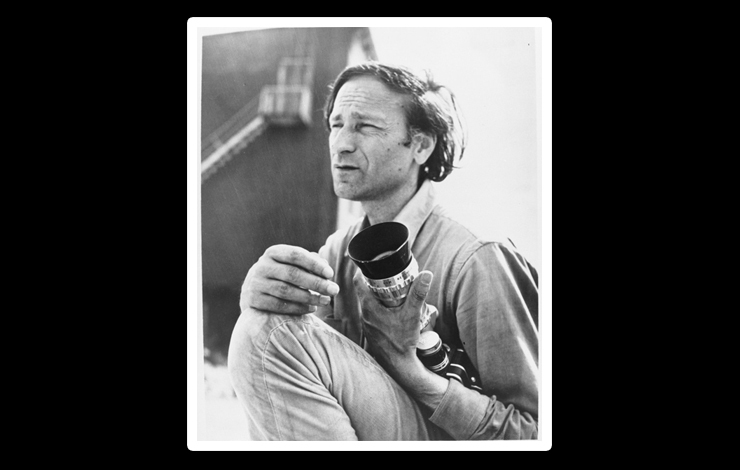 When Jonas Mekas arrived in New York City, in 1949, he had worked on resistance newspapers during World War II, in his native Lithuania; in displaced person camps following the War, he had begun to study film. His first documentary, Grand Street, was made in 1953, the same year he launched his first screening program at Gallery East. Two years later, he founded the influential Film Culture, a magazine that set the tone for American experimental film and reconsideration of the documentary. He also reviewed films ("Movie Journal") for The Village Voice (1958-77). In 1960, he helped found the New American Cinema group, a loose collection of such filmmakers as Shirley Clarke, John Cassavetes and Lionel Rogosin, committed to a "new cinema... for art, but not at the expense of life." Long a promoter of the underground film, he formed Filmmakers Cooperative as a distribution agency, in 1962. With Maya Deren, Amos Vogel and Parker Tyler, Mekas became a major voice in the establishment of an American independent cinema, tirelessly promoting the works of struggling artists, going so far as to schedule midnight screenings in theatres throughout New York City in the early '60s. With his brother Adolfas, he made Guns of the Trees (1961) and the surrealist comedy Hallelujah the Hills in 1963. His cinéma vérité documentary of the Living Theatre's production of The Brig in 1964 received the award for best documentary at Venice. The majority of his films are documentary in style and intent (Film Magazine of the Arts, 1963; The Millbrook Report, 1966; Diaries Notes and Sketches, 1969), including the autobiographical Reminiscences of a Journey to Lithuania, 1972. His establishment (with James Broughton, Jerome Hill, Ken Kelman, Peter Kubeika, P. Adams Sitney and others) of Anthology Film Archives, in 1970, with screenings of neglected post-war masterpieces, led to an expansion into publishing, preservation and reference services, culminating his work to preserve the progressive moments of cinema and to encourage reflection on the future for film and video. In presenting him with the Anthology Film Preservation Honor in 1996, director Martin Scorsese said, "I want to thank him for teaching me patience, and teaching me how to see."